This was another 3 wedding weekend here at Trisha's Flowers (I believe the third one we've had so far this year!) That many weddings means a full cooler, glue covered fingers, double and triple checking lists, and loads of beautiful flowers. Here's a few pictures of the team at work in the barn this week. Before cutting your hydrangea stems, you want to be sure that the plant was well watered a day ahead of time. 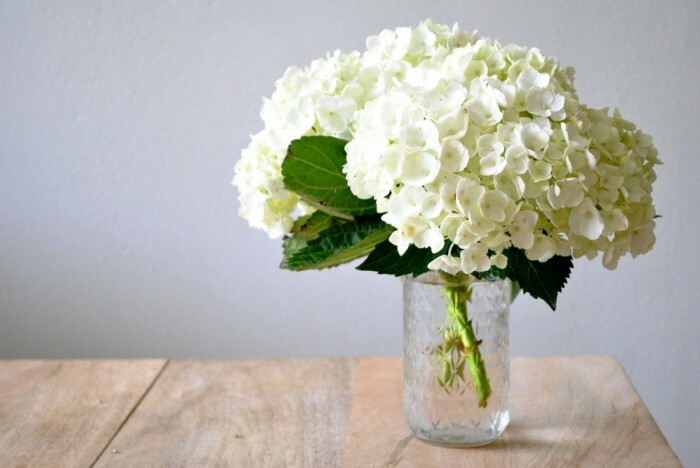 The word 'Hydrangea' comes from the root word 'hydra' meaning water. In other words, this plant loves water! It's best to cut hydrangea in the morning or evening when the temperatures are not as intense. If you cut your blooms in the middle of the day, the bush may be stressed from the heat and your flowers won't last as long. After cutting, place stems directly into warm water and then straight into a cooler or refrigerator. Be careful though, the ethylene emitted from produce can damage your flowers! If you do not have access to refrigeration, simply place stems in cool water treated with flower food. If your blooms begin to wilt prematurely, do not fret! There may still be hope! We have found that giving the stems a fresh cut, and then placing them in warm water has revived hydrangea in the past. With freshly cut hydrangeas in water, you can usually enjoy their blooms for about a week. This flower however, does not do well in floral foam (oasis) and will only last about 12-36 hours in foam. We hope you enjoy these bountiful beauties! Things are blooming and growing here in the gardens at Trisha's Flowers. We thought we would give you a sneak peak at some of the beautiful blooms currently in the garden. Remember, you can always stop by our location in East Earl to cut your own! Clippers and containers for water are provided. Zinnia - Every year we grow a variety of colors. Hanging Amaranthus - This is our first time growing this one. These dangling flowers are great for cascading arrangements and bouquets. Snap dragons - These long colorful stalks are bright and cheery. Lisianthus - Similar to a rose in shape, but with slightly more delicate petals. Each bloom is accompanied by a few small buds that give a fun variety of shape and color. We have ivory, purple, and pale pink. Larkspur - long and skinny with lovely purple or pink petals. Ageratum - these fuzzy pale purple flowers bring unique texture to your arrangements. Just a reminder that the Harvest View Barn is having their Bridal Open House this Sunday June 8th! It's from 1-4 pm and you'll have the opportunity to win prizes, sample desserts, and check out the beautiful venue! Trisha's Flowers will have a stand there and we look forward to meeting some future couples! Here are some pictures from a photo shoot done at the Harvest View Barn. We were able to supply the flowers for this photo shoot and we think the pictures turned out excellent. Just wanted to give you all a heads up that our 'About' page has been updated! We wanted you to be able to meet our team here at Trisha's Flowers and hear a little bit of the 'why' behind the 'what'. We hope it's helpful to connect some faces and names behind the flowers you receive. All photos taken by the talented Mark Van Scyoc. We had way too much fun doing this shoot. Although, Donna was a bit horrified that we were tearing apart all those pretty roses. We are proud to announce that Trisha's Flowers was chosen as one of the preferred floral companies for Harvest View Barn at Hershey Farms located in Elizabethtown, PA. Whether you want to be a summer or winter bride, Harvest View's climate-controlled barn offers a spacious indoor and outdoor venue to accommodate up to 295 people for your special day. From a balcony overlooking the peaceful pond to a grand fireplace and original stonewalls, Harvest View Barn provides the perfect blend of country elegance and convenience. Please mark your calendars and join us at Harvest View Barn's Bridal Open House on Sunday, June 8, 2014 from 1 pm - 4 pm. This elegant, countryside event will be fun-filled day featuring music, complimentary food and drink, dessert tastings, opportunities to win door prizes and much more! So bring your fiancé, as well as your friends and family, and discover for yourself what Harvest View Barn and Trisha's Flowers can offer you for your big day! The first 25 people to reserve a spot will receive a special gift. Please RSVP by May 25 to Shirley at info@harvestview.net or 717-665-7284 to provide the number of guests you will be bringing to the event. We look forward to meeting you! Today was a seed-planting day at Trisha's Flowers. It's still amazing to us that such beauty and life can come from such a tiny seed. We love to watch the garden change and grow over the next months and still get giddy when we harvest all that colorful goodness! We're trying some new techniques this year in the garden. Weeds can be an expensive and time consuming problem. This year we're trying some new methods of planting that will hopefully cut back on the amount of weeds in our cutting gardens. For some of the seeds we planted today, we laid down a layer of newspaper, 'watered it' and then added a layer of topsoil. The hope is that the seeds will be able to grow in weed free soil. Secondly, we laid out some weed fabric or 'woven ground cover' for planting some of our bigger plants. Just cut an 'x' in the fabric and then plant your flowers in the small opening. We'll see how it turns out this year and let you know! Here's hoping we can spend a lot more time harvesting and a lot less time weeding! On the heals of the sunny daffodils comes our other spring staple, tulips! Here in the gardens at Trisha's Flowers we're bursting with colorful tulips! We thought you might like to know some of the ins and outs of tulip care. Tulips are perennials so you won't need to plant them every year. However, after the first couple of years, (depending on variety) they tend to not come in as nicely. For example, purple tulips will revert back to the more dominant colors of red and yellow after a few years. For the best blooms, you may need to replant every couple of years. Once cut, they should last about 4-5 days. There are a wide variety of tulips to choose from. From shape, size, and color you can find a little bit of everything. Some with fringed and twisted petals, streaks, multiple blooms per head, double the petals for a nice full bloom, short, tall and of course almost every color imaginable. So, what are you waiting for!? Bring a little bit of Spring indoors with a handful of perky tulips, or start scheming your own flower beds for this fall! Now, bend your wires down. We're trying to create a stem! Next, using your floral tape, tape the wire all the way to the bottom so that no sharp edges poke through. You'll want to catch a little bit of the leaf in the tape to stabilize. Floral tape isn't like other tapes that stick with little to no pressure. This tape is almost like a wax and becomes adhesive when stretched while applying pressure. Pull the wire carefully through the center of your flower, stopping when you can no longer see the hook. Once it is pulled through, tape it the whole way down (including the existing stem) so there are no sharp edges poking out the bottom. Now that you have your focal flowers wired, and your base ready, you can tape them all together. Maneuver your flowers into the right position, and hold on tightly so they don't shift as you tape them together. Now you're ready to glue in your filler flowers. We use glue instead of wire for a couple reasons. 1. Most filler flowers that we use are too small to wire, and 2. 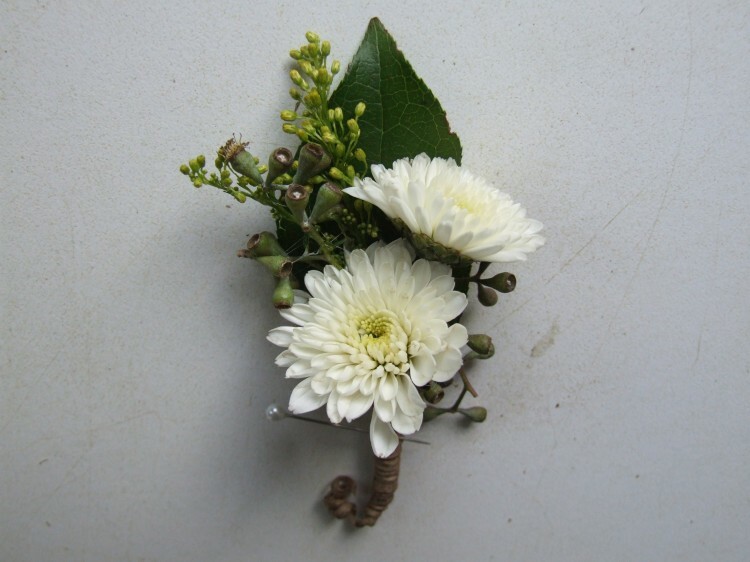 You want your boutonniere to be as light weight as possible, so adding more wire and tape would weigh it down. This process can be a little messy so you might want to lay down some newspaper to catch the drips. A little bit of glue goes a long way, and be careful to keep everything tucked behind your main flowers so you can't see the glue. We keep a mirror in our workspace so that we can check how our boutonniere will look pinned to a shirt. It's amazing how different it can look while sitting flat on a table compared to on a person. Lastly, now that you have everything in place, you'll want to cover your stem with something. Depending on the occasion it could be ribbon, burlap, twine, fabric, ric rac, or whatever you can think of! And of course, don't forget the pin! You did it! Give yourself a big pat on the back! We received the pictures from our photo shoot with Mark Van Scyoc and we are so pleased with them! Expect to see some changes on the website in the coming weeks, a long with a blog or two of the finished product. What you won't be seeing on the website are the behind the scenes shots that we enjoyed and chuckled at. We thought we'd share a few with you here on the blog. One of our helpers at the photo shoot was a day old lamb. She followed us around and overall made for an adorable addition to the photos. Trish and Lindy kept forgetting to keep their eyes opened during this part of the photo shoot. Careful, if you lay on the ground you might get covered in flower petals. Here's another wedding we had the pleasure of doing. Don't these colors make you think spring? This wedding was in October and they did all of their reception flowers themselves. Enjoy! We made a few pretty things this past weekend for a photo session with Mark Van Scyoc. We're looking forward to seeing the end product and be able to use the photos to update our website and promotional material. Here's a glimpse into what we made. Here's the photographer hard at work! He was awesome to work with! Wood you like some help? Have you ever been in the process of planning a party and felt like you didn't know where to start? 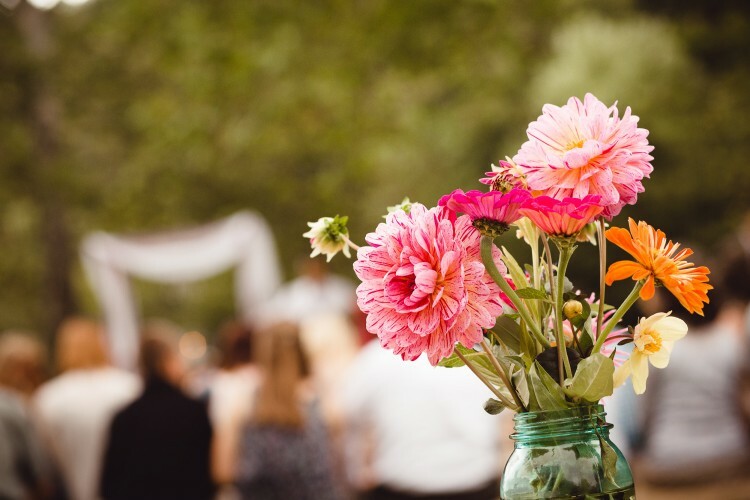 We wanted to give you some examples and tips on how you can use the different rental items here at Trisha's Flowers. For this baby boy's first birthday party, the wood slabs and branches were used for some decorative and practical needs. Check it out! This food table was spiced up with a variety of wood slabs and branches to give different heights and points of interest. They made a month by month timeline of the birthday boy. What else could you use these cute wood-burned table numbers for? Try using this long birch branch to make a unique sign. Feeling inspired to party plan yet? We hope so! As winter begins to melt away and the days start getting longer, one of the hopeful signs that spring has arrived is the appearance of the first daffodils. These perky flowers are sure to bring joy as their sunny heads sway in the breeze. Our first little bits of green are poking through and we can't wait till they make their full debut. We thought it might be good to give you a few helpful hints and tips for the world of daffodils. There are actually a variety of daffodils that vary in shape, size, and color; some are full and fragrant, others dainty and classic. Planting time is in the fall and you can expect to see their happy faces at the end of March to the beginning of April. For a longer life in a vase, harvest daffodils as soon as you see a little color and watch them stretch their petals out over time. When harvesting daffodils for a mixed floral arrangement, you must let them condition for at least 1 hour in water by themselves. Daffodils secrete a sap that is toxic to other flowers and could harm them when mingled immediately. We hope this is helpful! Enjoy! It can be very fulfilling and satisfying when you push through hurdles and mistakes in order to do something on your own. With the resource of the internet at most people's finger tips, it seems like the options are endless for what you can make without prior knowledge or skill. Here at Trisha's Flowers, we are passionate about seeing your event made special and complete, even if you'd rather do it on your own. Contact us for a free consultation and estimate for your wedding or event, and then order your flowers and greens through us. We've had the pleasure of supplying many brides, and here are a few pictures of what they came up with! Who would have thought a barnyard could look this beautiful!? The perfect fall colors mixed with the rustic scenery and decorations created a stunning visual display. We loved how the flowers turned out for Ryan and Laurell's wedding. We can't take credit for the potted mums, but aren't they a gorgeous touch? It was a pleasure to work for you Laurell & Ryan! We wish you all the best in your marriage! 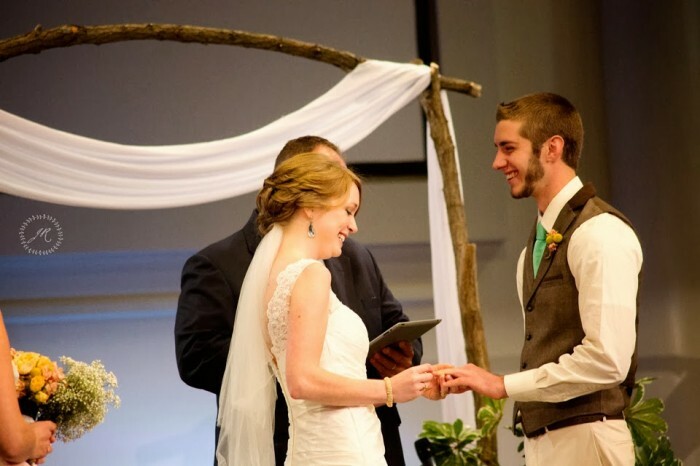 Here are a few pictures from a wedding we did last year. We loved how the different shades of purple, pale pink and green looked together. Jen was a beautiful bride and they had a lovely day to get married. Tim and Vanessa had a simple, yet elegant, November wedding. Working with a smaller budget, they went with babies breath for the bulk of their flowers. This sturdy staple flower, usually found as a filler in bouquets, can make a classic and delicate statement when grouped together as the main attraction. Here are a few pictures from their beautiful day. February 14th is quickly approaching and we hope you've been thinking about how to show those nearest to you just how much you care. 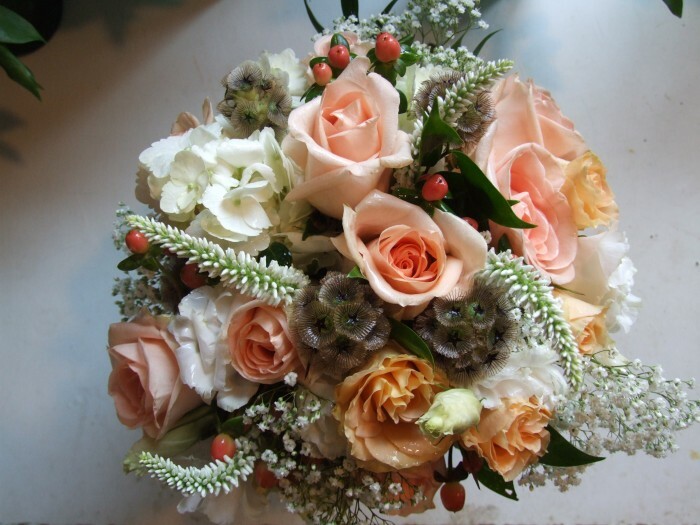 If a flower arrangement is what you're looking for then we can help you out! This year we won't be doing deliveries, so you'll have to stop by the barn to pick up your order. And remember, there may be people other than your sweet heart who could use a thoughtful gift on Valentines day. Get a jump start and order before February 7th and get $5 off! Flowers may be limited on v-day so we suggest ordering ahead!